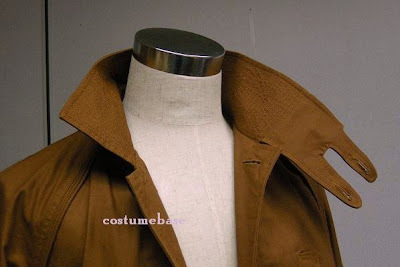 Propsummit.com a Blade Runner Prop Community Forum BladeRunnerProps.comView topic - Modding the coat collar to be more accurate? Modding the coat collar to be more accurate? Posted: Fri Oct 28, 2011 2:06 am Post subject: Modding the coat collar to be more accurate? I was looking at the Costumebase set, and it's not bad for the cost. However, the jacket collar just Isn't nearly as accurate as I would like. Has anyone modded theirs with perhaps an add-on part to give it a more accurate ribbed appearance, or have any sugggestions for materials/techniques to get it closer to the "real" one? The coller shape seems to be the biggest problem with all the versions off this coat. pics would help tho. I have the Costumebase coat and have started to mod the collar. I found a jacket at a charity shop that had a good ribbed waist in a beige. I removed the ribbed material and have dyed it to match in better with the coat. Then I moved house and went to work overseas. I should be getting back to it by Christmas. I will upload what I have so far. Look for jackets and coats with a ribbed tecture you like. I checked with a clothing alteration place and the combination of the coat and the ribbed material is to heavy for a standard sewinng machine but an old manual machine will handle it fine. I recently got one new that is for repairing horse blankets and leather work. still have to learn to use it. Thanks for the suggestion. I was considering a scratch build of the collar fabric if I can't find something "off the rack." Just have to wait and see how it goes. Thanks for the suggestions! Here are the photos of the jacket I am taking apart to mod my Costumebase coat with. Here is a link to the photos as I can't seem to embed the photos. Nice! That looks amazingly close! Thanks guys, good to know I am on the right track. Now to learn to use a mechanical sewing machine over the Christmas break. I have finally finished modding the collar of my costumebase Deckard jacket. Finding a material that was usable took the longest. The first dying was not satisfactory as you will see. I eventually painted on the rest of the collar with an airbrush. Sewing was done with a 1928 manual Singer machine. Collar of the original Costumebase Jacket. Jacket used for the mod, first dying attempt was only marginally successful as the synthetic in the mix did not take well. Looking good, I kinda like the two-toned effect (the ribbing is excellent). Is it stiffer than the other ribbing that was on the coat before? It is stiffer and has a much better weight. It sits properly now and works as an actual working collar that would keep out the wind. I stitched the new collar right over what was already there. The collar could be a little light, but I like it. From what I can tell the original collar is a slightly different colour also.